It’s amazing how we carry on traditions. My mother hosted Thanksgiving for the extended family until, one year, she was done and the tradition was handed down to me. As the kids married, we tried T-Day at in-laws and out-laws, and we all agreed, it just didn’t feel like Thanksgiving. Traditions die hard. In short order, I got the day. I tweaked the menu a bit, asking my son-in-law and daughter-in-law to bring their favorite dish or two from their family Thanksgivings. Those dishes have become a part of our evolving tradition. In addition to the meal, I also inherited the china, silver and crystal, which I used until the last few years ago when I purchased a new set of pottery that I like so much more and, even better, can be put straight into the dishwasher. No one seems to use the finery any more, not that I ever used it much in my adult life. But, it was an opportunity to teach my four grandsons all about forks; the oldest, my granddaughter, had already gotten that training from her other grandmother. The boys all stepped up and, each in turn, helped train the next youngest in fork and dining etiquette. Not only do they know forks, they know not to eat until after Grandma’s Grace, which is what their parents call my once-a-year blessing. The grandkids know to patiently wait and remain silent while their parents provide the mocking setup for the annual event. The younger ones know full well not to mess with Grandma; Christmas is just around the corner. Just to make certain the grandkids have the next holiday on the calendar and can start bugging their parents, each one of them gets a Christmas ornament with the slice of pumpkin pie. Retribution is a grandmother’s prerogative. A few years back, I had minor hand surgery in early autumn. The surgery went well; the recovery not so well and, in one of those small percentage glitches, the wound had a rough time healing. It finally started to do what it was supposed to do in mid November when I went in for my weekly visit with the surgeon. Looking good, he said. I’m assuming you do Thanksgiving. The hand is still not totally healed. You can’t do the cooking. You can host it. Nope. Not til it’s fully healed. Get the kids to help. Seeing as no one answers their phones anymore, I sent a text asking for help as I was barred from the kitchen. I could still host but the few days of intensive kitchen cooking was out. My daughter was the first to respond. I don’t cook. I already knew that. I raised her to stand strong and independent, which she is, except in the kitchen. Her husband says she’d starve to death if she couldn’t find someone who could boil water. My daughter-in-law was marginally more helpful. Whole Foods has a package deal. We can do that. I don’t do dishes. My son jumped in. We’ll bring paper plates. This was proving to be more challenging than I thought it would be. I texted back, Thanksgiving. Traditions. Dishes. All that Stuff and Stuffing. Leftovers. Take out? Silence. Evidently, it was a take out or leave it proposition. So I left it, sadden by the knowledge that when I can no longer handle T-Day, it might well evolve into a take out with paper plates day, given that everyone is too stressed in forty different directions to dedicate a day to family, gratitude and tradition. In the meantime, thank goodness for the internet; there were entire websites devoted to make ahead Thanksgiving recipes. I lined them up, and one at a time, got them done with no strain on my hand. And, on Thanksgiving, the kids proclaimed it was the best dinner ever. Of course they’d say that; all they had to do was show up and eat. They still had to do the dishes. Wow. Amazing how things evolve!! 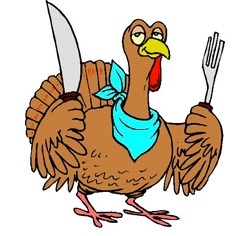 Hope your T-day goes well this year!!! Our Thanksgiving dinners usually include a dozen or so photos or video clips that are exceptionally pretty or funny, are accompanied be a great story or are the most recent Santa’s lap picture. This year it was a black and white (actually totally degraded technicolor) of Xom-Kat Vietnam on Thanksgiving Day in 1966. It was a human interest bit about what the GI’s were having for dinner. And there, sitting among the sandbags was my brother Michael–thin, serious, and grateful. On the phone later he told me he remembers the meal well.